We are so excited to help you find the perfect dress for your Best Day Ever! We strive to keep a range of styles and sizes for you to try, but keep in mind that we are a boutique and not a mega store. On average we have 3-9 dresses per size in-stock, however we do sell dresses off the rack so our inventory changes daily. 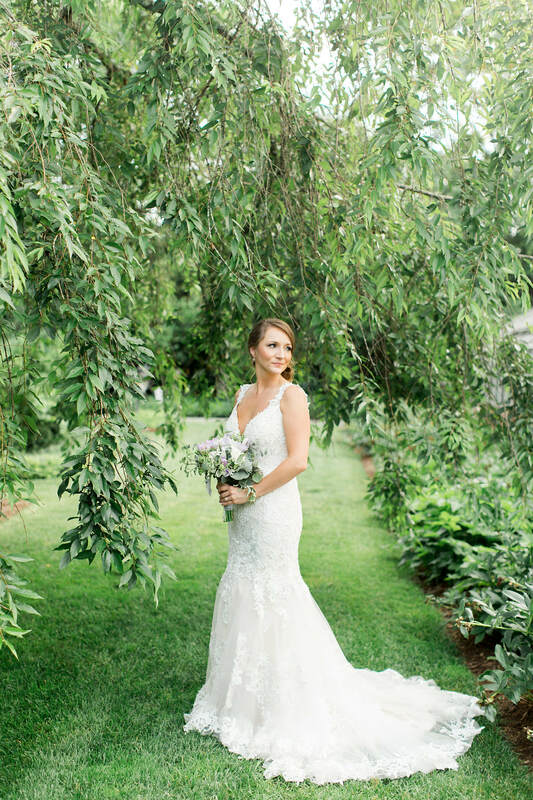 If you have allowed yourself enough time to order your dress, you can try on dresses that are larger or smaller than your actual size, which will open you up to a lot more options for your big day. We highly recommend that you also read our about us page prior to your visit, so you will have a better feel for who we are and what to expect from our store. We work closely with designers & manufactures, choosing only the most exquisite & most affordable gowns to add to our collections! The Inspire Collection gives brides designer quality, style, and detail without the designer price tag in a range of classic to modern designs. What makes Inspire dresses different? Simply that they are not advertised online or in print, cutting the advertising costs and passing those savings onto the Bride! Another Bonus: Our Inspire Collection gowns are not over-saturated in the marketplace, allowing our brides to have a more exclusive selection of gowns to choose from! Since Inspire gowns are unadvertised we are unable to provide "stock" photos, but we invite you to follow us on Facebook and Instagram where we regularly post our newest arrivals. The Gallery Collection designs are streamlined with and emphasis on the mantra "less is more". The gowns place great emphasis on the bride's silhouette, whether it's extra boning or structure. The result, a beautifully simple and modern look at a very attractive price point! It's the perfect choice as a reception or outdoor gown where the beautiful bride's focus is on staying light and comfortable. Just the little extras we include to let you know how much we appreciate, and value you. The brides accessories are 15% off including; veil, headpiece, jewelry, & garter! Your entire party gets 10% off their bridesmaid dresses & accessories! Every gowns gets a free initial inspection and pressing when it arrives. These are just a few of the "Love-Ups" we include with each bridal gown purchase. We would love to share the details of ALL of our extras with you during your visit! *Note: All current styles may be purchased off the rack, or we can special order within the lines we carry to suit your needs. Remember a special order takes time, 20+ weeks for some collections. Read our dress ordering policies here. 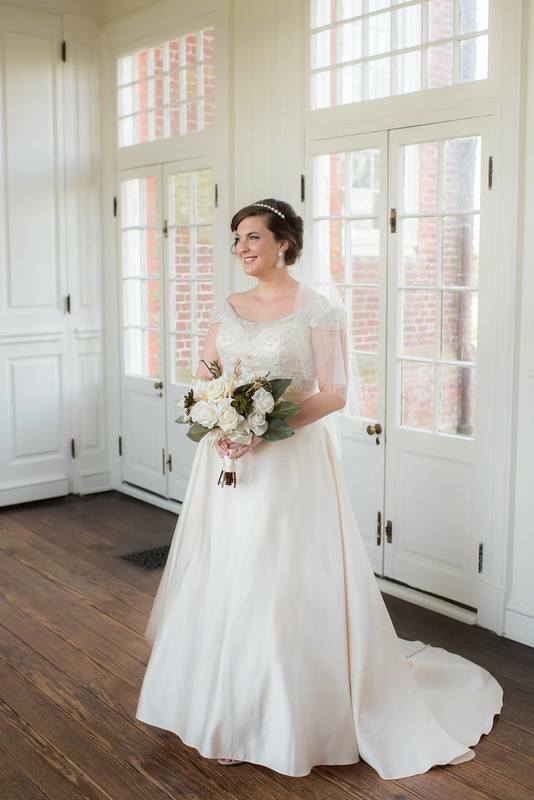 We have sizes 4 to 28 in our inventory, with sizes 6-20 having the largest selection of gowns. 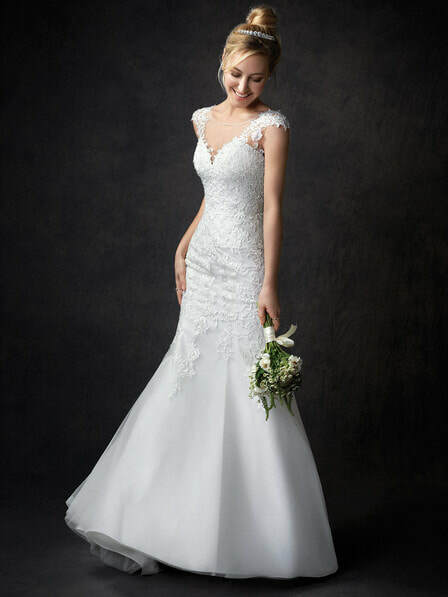 Our bridal gowns range from $448 - $1295! If you are looking for an even bigger bargain, shop our retired styles for big discounts, with dresses starting at just $99!